Audio Pro Drumfire speaker system plays loud and proud as one of the biggest and most powerful multi-room speakers available anywhere. Think of a multi-room speaker and you’ll probably think of something small, inconspicuous and modestly powered; Audio Pro’s Drumfire is a different kettle of fish altogether! Designed for those who want their multi-room speakers big, beefy, loud and proud, the Drumfire is here to rock you! We’re big fans, here at Audio Affair, of Audio Pro’s range of wireless and multi-room speakers. Fusing cool and cutesy design language (go on you can’t deny they look like a little Koala) with great sound quality, the Addon speakers have come to define the brand. Clearly, someone at Audio Pro got sick of having their products called cute and cuddly, because their latest speaker system, the Drumfire, is a radical departure! A cursory glance at the Drumfire might have you thinking you’re looking at a guitar amplifier, but believe it or not, this is Audio Pro’s latest multi-room speaker offering. 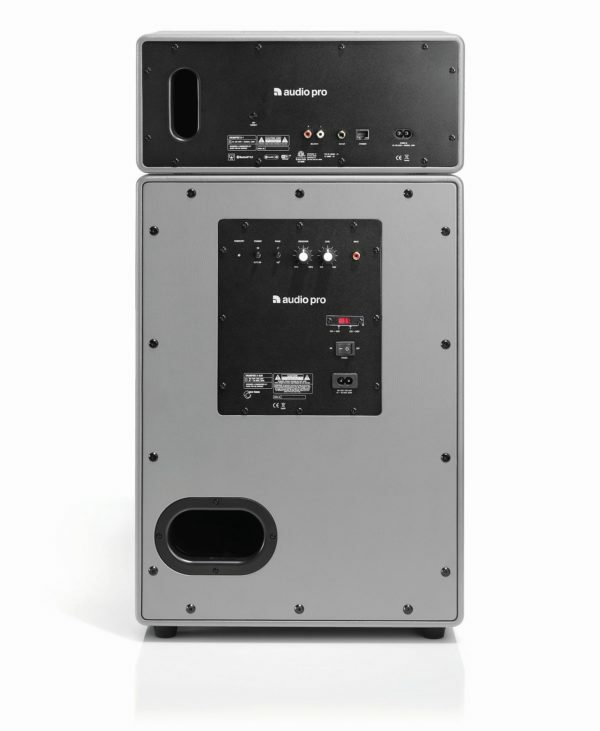 A two-box design, the Audio Pro Drumfire comprises of a “head” which contains the user controls and the high/mid drivers, and the lower cabinet which holds additional circuitry and the large low-frequency driver. 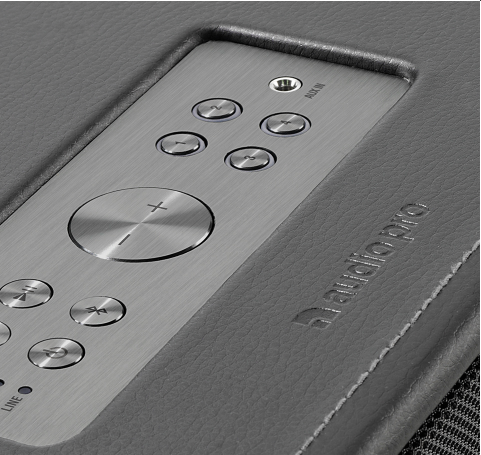 This is a speaker system designed to rock, with 300-watts of bi-amplified power on-board! OK, so we know this thing is loud, but if you just want a loud self-powered speaker, then there’s plenty of those on offer; what makes the Drumfire so special? Well, apart from the mutli-room, wireless connectivity (more on that shortly) the Drumfire is a quality product both sonically and aesthetically. The vintage guitar amplifier aesthetic continues with hand-stitched, leather grain vinyl covering which provides a lovely contrast to the aluminium control panel and detailing. Anyone who’s used Audio Pro’s powered speakers before will immediately be at home with the controls which are intuitive for first-time users, too. We really should talk about the driver compliment loaded into the two cabinets of the Drumfire, because it’s these which really give it the rock ‘n’ roll kick which sets the Drumfire apart. In total, there are five drivers loaded into the Drumfire, which help to propel the 300 watts of amplification. Two 4.5″ mid-range drivers are accompanied by two 1″ textile dome tweeters in the upper enclosure; these are joined by a beefy 8″ long-throw woofer in the lower enclosure. Both enclosures are rear ported, and in combination provide a frequency response of 45Hz-22kHz; impressive stuff! Aside from the BIG sound afforded by the Drumfire, the other main feature is Audio Pro’s easy to use multi-room streaming technology. Whether it’s enjoying music from your favourite streaming services or filling the house with sound, Audio Pro’s multi-room app lets you enjoy music your way. Let’s say, for example, that you want to play Beyonce in the bathroom whilst someone else wants to hear Kylie in the kitchen; no problem, the app lets you stream different songs to different Audio Pro speakers at the same time. Want to turn your house into a nightclub? 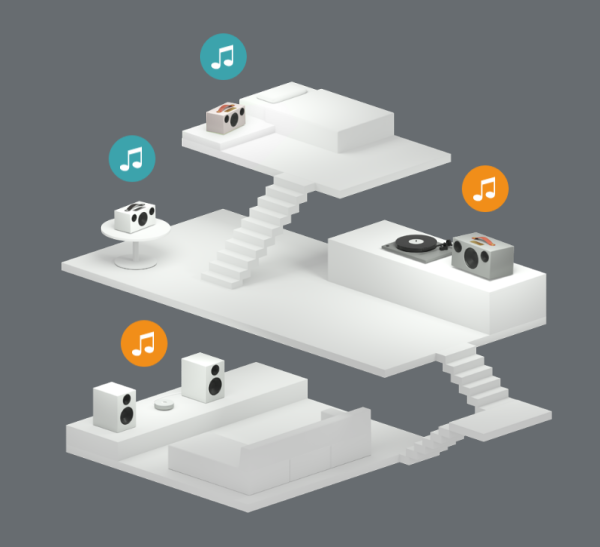 Stream your favourite tune, radio station or even vinyl record (via aux connection) across the whole house. It’s easy with the Audio Pro multi-room app. If you really want to wake the neighbours, then you can also use the multi-room app to pair two Drumfire speakers together for a stereo experience; bringing the stage to the sitting room has never been so easy or convenient! If you’re looking for a wireless, multi-room speaker which has sonic heft and visual appeal unlike any other, then check out the Audio Pro Drumfire speaker system. You’ll love it, your neighbours might not!